An unseen, but freely selected card is placed into your empty jacket pocket. "This is a mystery card. It's a mystery card because its identity will remain unknown. We'll return to it later." A second spectator freely selects and signs another card. This one is lost into the deck. The performer then reads this spectator's mind correctly divining both the card and the writing on the card. The first spectator then reaches into your jacket pocket to remove the mystery card. It is the signed card! The pocket is otherwise empty. This is Richard's favourite impromptu card routine. He has performed it for over twenty-two years in restaurants, formal parlour shows, private parties, walk around, bars, conventions and lectures. This is the effect he uses to impress a potential client and is responsible for getting me many private gigs. The Mystery Card To Pocket is completely impromptu. Absolutely, no set-up or preparation. Both selections are totally free choices by the participants. No forcing. The spectator removes the card from your pocket. Use any deck, even borrowed or incomplete. Does not use duplicate cards. Suitable for most performing conditions. The Mystery Card To Pocket never fails to make a huge impression. Includes the full script for the routine. Spectator can even draw a picture on the card, which the performer describes! 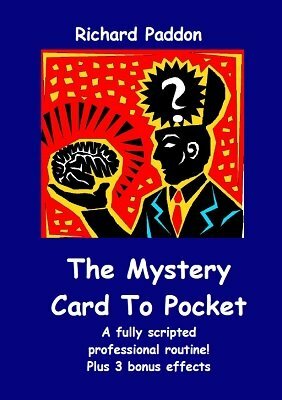 Richard explains in detail how to perform The Mystery Card To Pocket , including all the nuances and psychology gathered from years of experience and performing The Mystery Card To Pocket over five thousand times! PLUS three bonus card effects from Richard's professional repertoire. All are easy to perform. A selected card ends up in a finger trap that has held the performer's fingers together throughout the routine. This is the original, card to finger trap effect. An easy effect that gives the old 52-On-1 gag-card a real magical finish. A fully-scripted and fun card routine that utilizes everyone's favourite novelty; the Fortune Teller Miracle Fish. Perfect for adults and children. So easy, with the emphasis on entertainment. Includes an explanation for how a Fortune Teller Fish works. All the routines have been performed thousands of times for "real" people in numerous performing conditions.